Congratulations to the International Degree class of 2009! International Degree graduates receive two bachelor’s degrees on commencement day: a bachelor’s in the primary major and a BA in International Studies in that major. Pictured here are students who are graduating with degrees in Biology, Business, Chemical Engineering, Fisheries & Wildlife Science, Microbiology, Nutrition, Political Science, and Sociology! Some are Honors College students; all have studied abroad, learned a foreign language, and researched a topic relating their majors to the world around them. 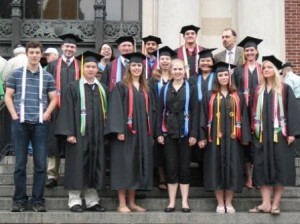 In fact, the ribbons they’re wearing signify the colors in the flags of the countries where they’ve studied abroad! These graduates are off next to medical school, teaching English abroad, working for Americorps, researching at National Institutes of Health, and other jobs throughout Oregon and the world! Learn more about the International Degree! Posted in Commencement, International Degree.